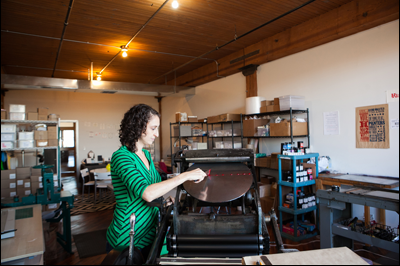 Shayna Norwood is the force behind Steel Petal Press, the design and printing studio she founded and operates since 2008. 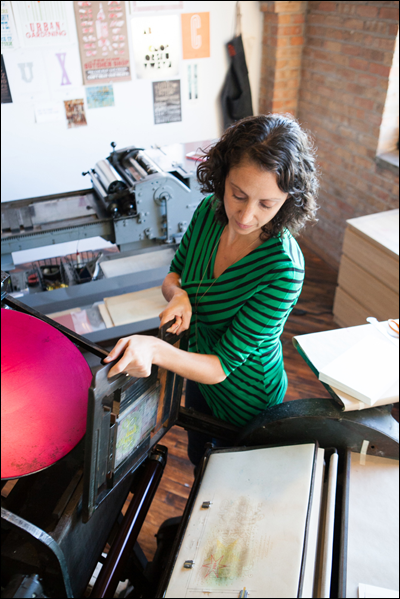 She has been letterpress-printing since 2004. 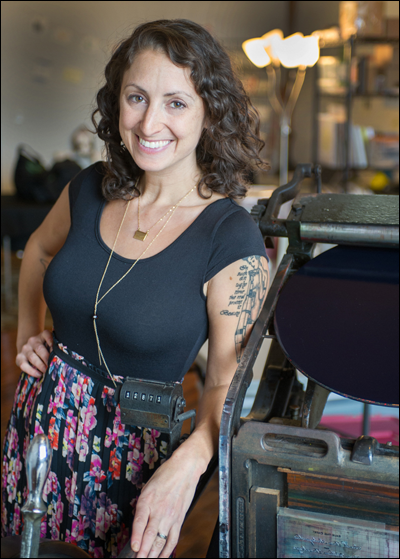 Here, she shares her thoughts on the requirement of complete dedication toward becoming a small creative business, and the lasting appeal and utility of letterpress. 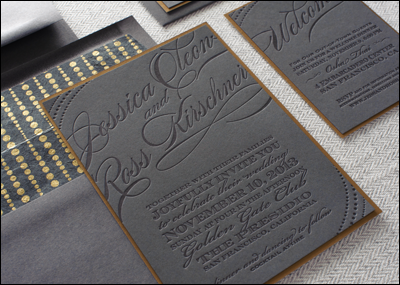 How did you discover the medium of letterpress printing? 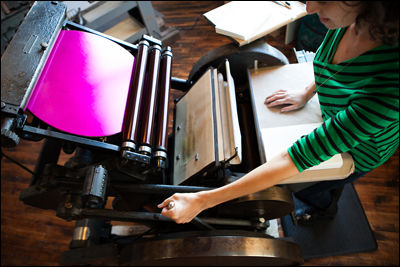 I was first introduced to letterpress printing while I was in art school earning my BFA. I took a year-long Artist Book class in which we learned bookbinding, letterpress printing, and conceptualizing the object of a book as art. full-time letterpress designer and craftsperson? 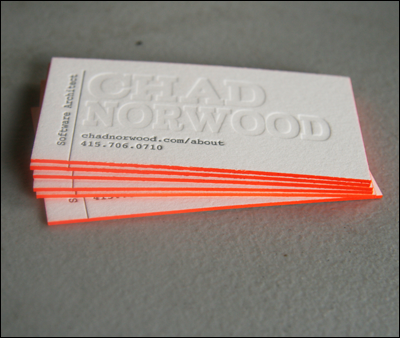 When I got into letterpress, I knew that one of my options coming out of school was to work in the stationery world. So when I was laid off from my part-time customer service job, I decided it was time for me to give it a shot. I am a classically trained artist, so I didn’t see many other career options that were appealing to me. What were essential activities/steps you took to start and establish yourself as a letterpress maker? And why were these activities/steps important? Getting laid off from my job was crucial in freeing up my time to pour myself into being creative and really giving my new business everything I had. I also was able to collect unemployment while working on getting my business off the ground. Other than that, I really just spent every second and ounce of energy I had, and poured every cent into practicing printing, making new work, and working on my business. 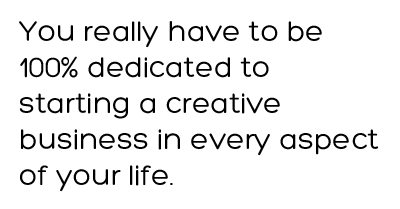 I think you really have to be 100% dedicated to starting a creative business in every aspect of your life. 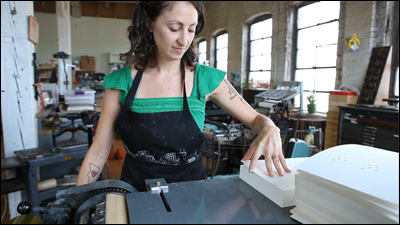 Mastering letterpress is all about attention to detail and practice, practice, practice. The more you print, the better you get. Even if I messed up, miss printed or no one bought a certain design, I would just keep trying new things until I got it right. and particularly seized by women. Why do you think this is? 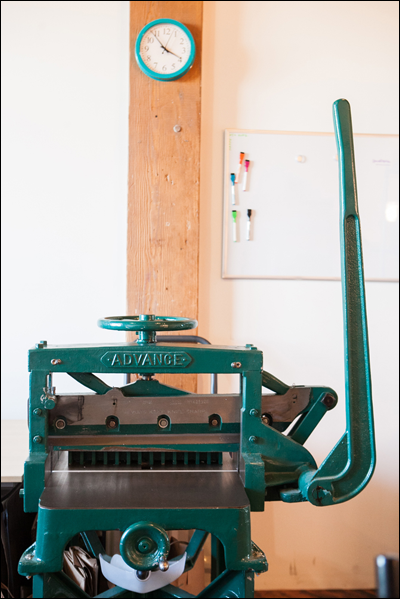 Letterpress has had a regrowth along with the handmade, handcrafted movement. As so many things become impersonal and mass produced, more people are craving a human connection to their products. Women in particular have seized letterpress, I believe, because of it’s connect to stationery, and more specifically wedding stationery. 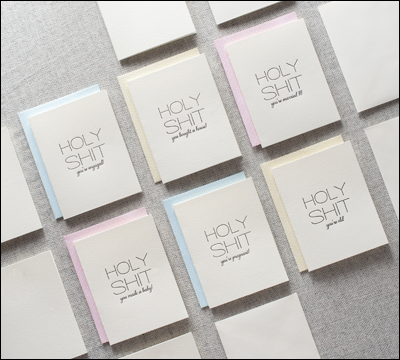 There are definitely plenty of men letterpress printers out there, and men who print stationery. It’s just not ALL men anymore, like it used to be fifty years ago. What are your your printing presses? How did you find them? And how did you arrive at their nicknames? I have a 1960s Chandler and Price model-N named Penelope (above). I bought her from Paul Aken, an active printer and collector who runs the Platen Press Museum in Zion, Illinois, one hour north of Chicago. I wanted to name her to have a woman’s “P” name, so Penelope worked. I have another 1960s Vandercook SP-15 named Sweetie. I bought her from a former studio mate and stationery designer who began to outsource her printing, and no longer needed the press herself. She’s much less of a beast compared to Penelope, so “Sweetie” seemed to fit. Printing is an important form of communication. It’s more tangible and permanent then digital correspondence or verbal language. It’s more democratic and wide reaching than handwriting. It creates permanent, tangible and wide reaching records of the world. Who are your influences related to design and craft? I know some really amazing and inspiring stationery designers/friends who are doing really great, beautiful work. Seeing what other people around me work pushes me to be better. But I’m also inspired by anything visual or creative really, anything from Eames Chairs to Calder Mobiles to a Banksy Stencil. My work has to feel genuine, otherwise, I don’t enjoy making it and it will show in the final product. How do you attract work, customers and clients? There’s creative growth in terms of the types of products and services I offer and how many new designs I add to my lines. There’s also financial growth in terms of my sales numbers each quarter or year. And then there’s general business growth in terms of how many people I have working for me, or if any new equipment is added, or if I need to move into a larger studio. How would you describe your business’ work culture? I’m a really small, local business that focuses on handmade products. I think that’s a huge part of my branding and identity as a business. People aren’t just buying a card, they’re also buying me and my story. Even though I have other people in the studio that help me out, I want to keep the culture and energy of a small creative business. 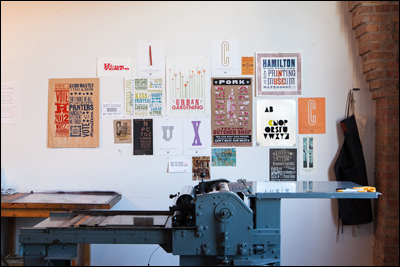 Where can people see and buy your letterpress-made products? Online on Etsy. I’m also working on getting my online shop set-up, so in the next month my cards will be for sale directly from my website. I also sell my cards to bunch of fabulous brick and mortar stores all around the country. You can see the full list here. I’m a member of Crave which is a national network of women business owners and entrepreneurs. 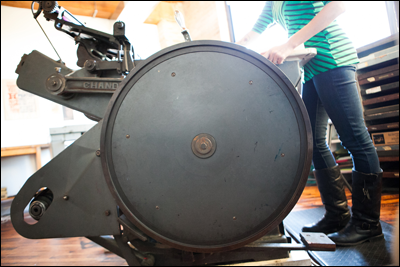 Ladies of Letterpress is another fantastic network of women letterpress printers. And I can’t say enough great things about Women’s Studio Workshop where I spent six months as an intern after college and I really learned more about art, printing and book arts. I actually have been really lucky to not have many disagreements while working. But if something does arise I try to be as diplomatic and level headed as possible. It’s really hard to separate myself from my work and if I don’t make an effort to not work, I end up working all the time. I deal with it by creating set times I go into the studio and times to do other things, like hang out with my husband or dinner with friends. I try not to work on weekends, but I’ll usually end up answering emails or doing some design work during that time. I have a 450 sq. ft. studio space (above) at Lacuna Artist Lofts. It’s a beautiful old converted industrial building. It has great light and a fantastic view of downtown Chicago. Most importantly it’s air conditioned in the summer and heated in the winter (unlike my previous space), so it’s comfortable to work all year round. I use all the Adobe Creative Suite (mostly Illustrator) to created designs. Dropbox is fantastic for sharing large files. For inspiration I’m inspired by language and communication. Greeting cards are all about connecting people to one another on a personal level. I usually get an idea for a card by thinking about how I communicate with my friends, family and colleagues. I’ve found that if something resonates with me, it often translates to a larger audience. Bad design hinders or prevents an item from being used for it’s original purpose. Like a wedding invitation where the font is unreadable, or a house with an awkward entry way. Then there’s always a matter of personal, visual taste. That’s awesome. Make sure it’s really what you want to do, and be prepared to work really hard and not get paid a lot. 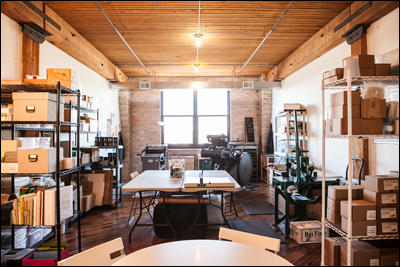 Chicago is definitely a great place to be a letterpress printer. There’s such a great, rich printing history rooted in Chicago. It was the epicenter of the printing world for most of the 20th century and printing history is all around if you know where to look, from the Platen Press Museum in Zion, Illinois, to Hamilton Wood Type Museum in Wisconsin to Vandercook’s grave on the north side of the city. It’s also greatly affordable (compared to other major cities), and I can get a great studio space for not a lot of money. All images courtesy of Shayna Norwood of Steel Petal Press. Typeface of quote is Hero designed by Fontfabric.